179 pp, applied cover, collection of dialogues for school children, lists characters and props for each scenario, preface by author, beginning and end pages contain advertisement for publisher's other books. 175 pp, cover is dark brown blind stamp with gilt stamp spine, frontispiece and illustration on title page, chapters include Neighbor's Gossip, A Great Change, Secret Schemes, and New Connexions, part of the Appleton's Tales for the People and their Children collection. 192 pp. Green cloth cover, applied color illustration, white cover and spine titles, illustrated end pages, frontispiece, color illustrations throughout by Beatrice Stevens. 38 pp. Applied printed cardboard cover, second edition, sewed binding, music with descriptions and instructions. 304pp, leather covers. The full title of this book is 'The Rhetorical reader : Consisting of Instructions for Regulating the Voice, with a Rhetorical Notation, Illustrating Inflection, Emphasis, and Modulation, and a Course of Rhetorical Exercises.' This is the two hundred and twentieth Edition, with an Appendix. Measures 7" x 4 1/2"
. Leather covers show edge wear and damage due to rubbing, especially on the spine where a piece has separated from the block on the top. Additionally there is a piece of leather missing on the top right corner of the front cover. Interior pages are soiled and tone due to age, with some foxing. The free end paper and fly paper are missing the top right corner. Additionally there is penciling on the end papers. 143 pp, light green applied illustrated cover, Children's spelling lesson book, describes sounds and includes practice lessons, contains illustrations, preface by author, ends with weights and measurements and multiplication tables. Walker, Alberta, and Ethel Summy. Let Us Read. [New York]: Charles E. Merrill Co, 1929. 32 pp litho on paper wraps. 153 pp, stamped cloth over board covers. This book is a collection of ten short stories told by Aunt Martha to her rambunctious two nephews. The stores are meant to be educational, yet fun. The stories center around the things found in Aunt Martha's cupboard, and relate the history of the item. The ten stories are entitled: The Corner Cupboard, The Story of the Tea-Cup , How the Tea-Cup Was Finished, The Story of the Tea, The Story of the Sugar, The Story of the Coffee, The Story of the Salt, The Story of the Currants, The Story of the Needle, The Story of the Cotton, The Story of the Rice, and The Story of the Honey. There are forty-seven (47) black and white engravings,the subjects of which range from landscapes, to people, to animals, to maps. The front cover has a stamped illustration of Aunt Martha's cupboard. 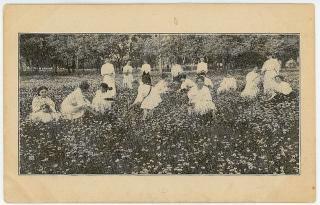 Measures 7" x 5 1/2"
A 3 1/2" x 5 1/2" card with an image from a photograph of young women graduates in a field of daisies gathering the ephemeral flowers. The reverse has a stylized, art nouveau influenced daisy at left. The narrative describes the Bethany Campus as one of the beauty spots in "Little Lindsborg" the Park City of the Smoky Valley. It describes the flowers, the jewels of Nature, appearing in their glory during Commencement time, that period of commingled joy and regret for the parting which can be known only by college students, and do no wither away until the last lingering ones have left their Alma Mater..."This picture of the daisies has evidently touched a responsive chord in the memories of old Bethany students, for ten thousand have been called for and still more are demanded." . Bethany College was established by Swedish Lutheran immigrants in 1881. A liberal arts college. Reward of Merit depicts Female Textile Mill Workers. ..
A 3 1/4" x 3 5/8" Reward of Merit for diligence and good behaviour. Intricate engraving depicts women operating looms and working with the completed fabric. Moral -- if you are diligent and behave you can be a factory worker. Hmm... Reverse is blank.. The printed questions for the written exam for common school teachers in Caledonia Country, Vermont. 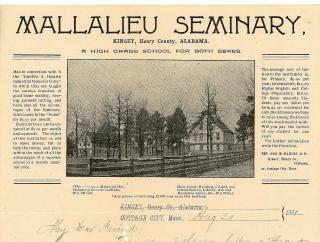 The took place on Saturday, May 6, 1883, and when from 9:30 AM to 2 PM. The printed exam starts by listing the regulations and standard of qualifications for the exam before continuing onto a section called 'General Questions', which is essentially the biographical information of the test taker. From the the exam is divided into four sections: Geography, Grammar, Arithmetic, and History. Each section has ten questions. Some examples of the questions asked are: Which as the greater area, Europe or the United States? Define Etymology. Compare goo, little, round, and honest. Divide .34 by .0034. Who would be President of the United States if the present chief magistrate should die? Printer Measures 9 1/2" x 5 1/4".. Original crease marks. Minor toning and staining due to age. 16 pp. booklet with original yellow paper wraps with 9 woodcut illustrations. Nine (9) identified illustrations include Lyre Bird, swallow, Boat Bill, Roseate Spoon bill, Blue Jay, Hoopoe, Robin, Belted Kingfisher and doves. Accompanied by narrative description and rhyming verse. 2 3/4" x 4 1/2" chapbook. Make-do sewing repair along back strip. This listing is an unpaginated picture book on board. It is An Object Lesson for Nursery Folk. New York Book Company. New York. No date. c1885. The cover illustration is an image of two dolls, one a maid, standing in front of a hutch. The interior pages includes images of different fruits, vegetables and other foods, candies, sewing supplies, toys including a golliwog and writing materials. Measures 6 5/8" x 8". Published in Bavaria. "We are Soviet children. We live in the Soviet Union. The Soviet Union is a great country. The Soviet Union is out Mother Country. We love our Great Mother Country. We love our Great Leader Comrade Stalin! Long live out Great Leader Comrade Stalin!" Additionally, there are two charts in the back of the book. Only has the alphabet, and the other is what appears to be a bingo game sheet of easy English sight words. Measures 8 3/4" x 6 3/4".
. Moderate edge wear. Previous owner inscription on title page. 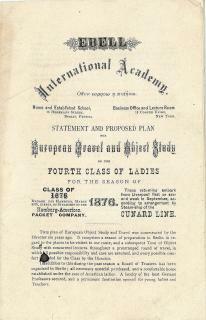 24pp booklet beginning with the prospectus for the class of 1876. A course for American Young Ladies who would travel on Hamburg-American Packet Company of the Cunard Line through Hamburg to Berlin. Includes Berlin Courses of Lectures, Exercises and Excursion to concerts, museums, galleries, theaters, operas and more in Tegel, Potsdam, Charlottenburgh and beyond. This is followed by time spent in Dresden, Prague, Vienna, Leopoldsberg, Venice, Milan, Lugano, Geneva, Lucern, Paris, Versaille, London Old Scotland and many other destinations. There is a second more limited plan available. Concludes with Trustees and References. Measures 8 1/2" x 5 1/2". .
understanding and recognition of the page. Measures 6” x 9”. No OCLC. No. 903. 18 unnumbered pages with heavy stock litho covers. Nine (9) of the pages are on heavier stock and are outlines of flowers, the remaining pages are paper weight colored pages of the flower parts designed to be cut and pasted on the black and white pages. Rhyming verses re the flower on reverse of black and white illustration including Iris, Hollyhock, Zinnias, Sunflowers and Chrysanthemums. Helene Nyce illustrator. Measures 8 1/2" x 12 1/2". Single fold 8" x 5 3/8" blank pink 'inquiry sheet". The cover page addresses the purpose and use of the survey - to stay in touch with those who attended but do not hold the schools diplomas. Comment of note "Perhaps some of you women feel that, because you did not finish the course or because you are 'only housekeeping' it is not worth while to send in your report. You who are caring for your homes are doing the very work for which Hampton has especially trained you. It is the highest work that falls to the lot of a woman". Survey content includes information on spouse and his occupation, address, if you are housekeeping or teaching and if teaching specifics about the job, if you are engaged in a wage earning occupation other than teaching and information on community involvement. . Hampton University (HU) is a private historically African American university in Hampton, Virginia. It was founded in 1868 by black and white leaders of the American Missionary Association after the American Civil War to provide education to freedmen. 14 pp. Applied illustrated cover over cloth spine. Edited by Esther Averill and Lila Stanley, full color lithographs by Fedor Rojankovsky. The adventures of Daniel Boone and his encounters with Indians, , hunting, traveling into the wilderness, and war. 63pp. Stamped Hardcover. In-text black and white illustrations. Simple instructions for children to make doll's furniture out of paper or cardboard. 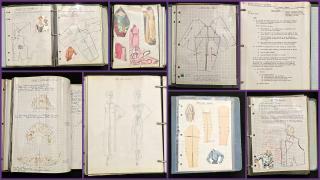 Including full page fold out patterns. OCLC 5. Measures 6" x 8". The primer has the basics that any young child would need to advance their literacy. 24 unnumbered pages, printed, pictorial wrappers, woodcut illustrations, all color. Contains the alphabet, word list, as well as text, mostly about animals, that incorporate a specified vocabulary list that is paired with it. 8" x 5". OCLC - 6 found with publishers Davis, Porter & Coates - None found with Davis & Porter & Co. (October 2018). A series of life-like miniatures of famous motion picture stars in original costumes worn in pictures.This is the First Series, including eight (8) different paper doll stars, each with three (3) actual movie costumes with accessories. They include Colleen Moore, Rudolph Valentino, Tom Mix, Mae West, Norma Talmadge, Douglas Mac Lean, Norma Shearer and Reginald Denny. Elaborate costumes as seen in the early movies. The reverse is blank. Each measures 10 1/4" x 14 1/4". Scarce. .